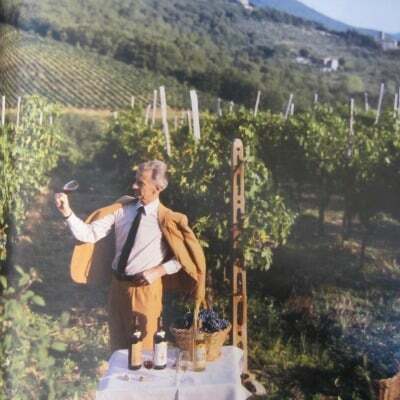 Last summer, a reader responded to a post by reminding me that in Slim Aarons's photography of Italian aristocracy, most wore cream or tobacco-linen suits, a white shirt, white hank and black knitted-silk tie. 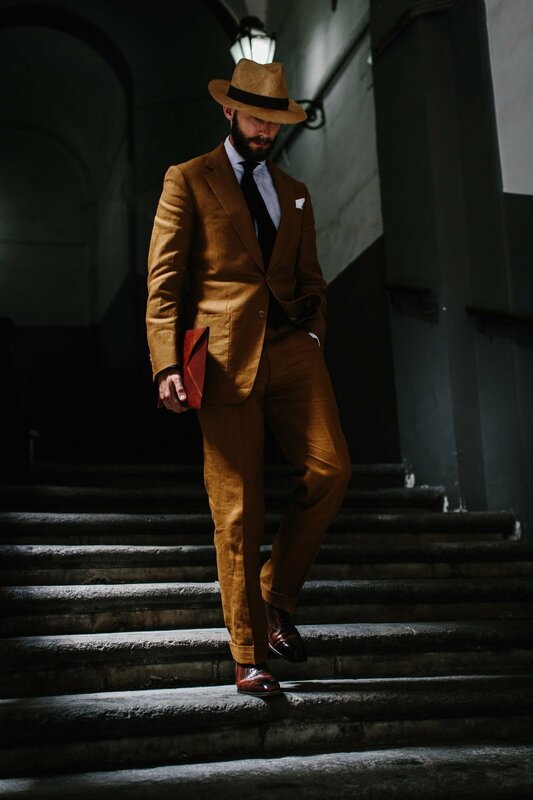 The post had been on 'Dressing pale colours for summer', and recommended that readers eschew strong colour in summer tailoring and match it with muted shirt/tie combinations. 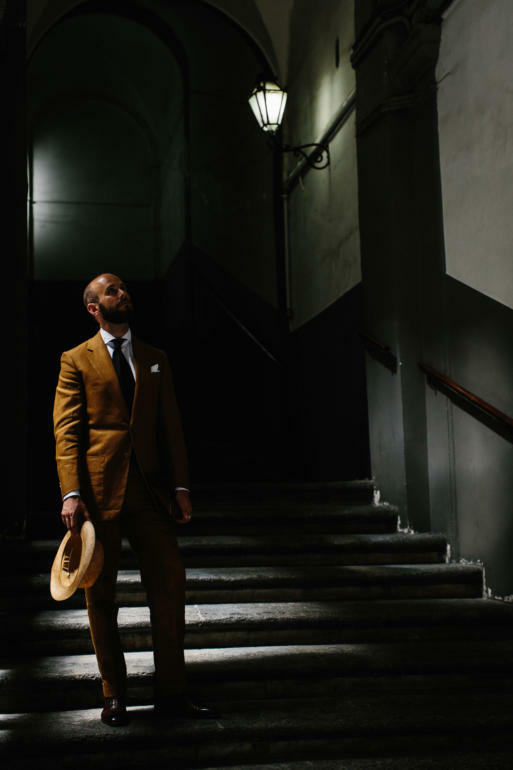 The dress of Italy's traditional elite in Aarons's photography was even simpler, if anything. But also a lot starker. They have no discernible pattern in suit, shirt or tie. Accessories too, are simple. But the white shirt and black tie makes for high contrast, particularly against tobacco and cream. It is this high contrast which makes such an outfit difficult to wear for most people. Skin that is even moderately fair (as mine is most of the year) cannot cope. I apologise, by the way, to readers that point out I don't cover the interaction between skin tone and clothing very much. It's a complicated area, and one whose importance I think is often exaggerated. But high-contrast outfits such as this are a good example of its importance. And just as much, of light. The outfit I am wearing here - the same as those Italian aristos, with tobacco linen, white shirt and black tie - would be too strong in contrast for me until I have a tan in the summer (I tan quite easily). And it would be too strong on any but the highest of high-summer days in England. The sun is simply not bright enough. Here, I am wearing it in Naples. On a scorching day, with deep, sharp shadows. It fits the environment, as well as me, and that is just as important in your clothing as whether it fits the company and the event. The suit is my wonderful bespoke linen from Dege & Skinner - linked to below. And the hat the sisol straw from Anderson & Sheppard that I seemed to take everywhere with me this summer. The stairs, by the way, lead up to Marco Cerrato's atelier. You can follow the discussion on Italian aristocracy: Black and white by entering your email address in the box below. You will then receive an email every time a new comment is added. These will also contain a link to a page where you can stop the alerts, and remove all of your related data from the site. Precisely. As much as I’m a fan of this look, there’s virtually no situation I can think of in which one wouldn’t stick out like a sore thumb if you were dressed like this the UK (particularly if you live outside southern England). Unless you spend a substantial amount of your time on business in sunnier climes, or attend summer garden parties for a living, then you’d risk being labelled as someone with a serious ‘Man from Del Monte’ complex! With a blue shirt and navy tie, it would be a lot more versatile. Thanks. To be clear, I do think it is very important, but it is sometimes described as something that rules out entire colours or types of clothing for certain skin tones. A lot of these effects can be mitigated by the things they are worn with. Do we live in different universe? Slim’s La Dolce Vita contain little like you say, and all my life in Italy I don’t see you black and white style. Sorry. Interesting, thanks – I haven’t lived in Italy for any lengthy period and wouldn’t know how prevalent it is generally. It’s great that we’ve got cardigangate behind us and are now back on track. That said, D.Thompson is quite correct and puts it very elequantly, it is not possible to exaggerate the importance of skin tone and hair colour when choosing clothes. It should be the foundation for everything and an incorrect choice in the colour of a foundation garment can’t be mitigated by accessories. As somebody who has a full head of white hair and a white beard, the vast majority of my wardrobe consists of some shade of blue and grey. I don’t regard this as a restriction but rather as an essential foundation. The suit colour here, is good for you. The shirt and tie less so. Of course, this is a hot climate outfit and would look completely out of place in the UK save, perhaps, on a scorching hot day at Goodwood or Wimbledon. Although I travel a lot and can wear this colour. I wouldn’t pick it simply because when I go to hot climates, I normally only take one suit and that’s a blue linen and I can get lots of different uses out of it often, with the same people seeing it on multiple occasions. With this, once you are seen in it, you are remembered and then it becomes a case of : ‘that guy’s got that suit on again’. Thanks David. However, it sounds like you have rather extreme colouring, with all that white going on, and yet your clothing choice is pretty similar to everyone else’s – i.e. navy and grey. I would suggest as an additional point, the fact that menswear in general is much more suited to a range of skin tones. Formal menswear, at least, consists of such versatile colours in navy, mid-grey and white or blue shirts, that it can suit most people. Dear Simon, I recently came across an American company, Enzo, who seems to be offering bespoke services. Their website is here: http://www.enzocustom.com. I am wondering if you have any plans to review this atelier? Warm regards, Joshua. Hi Simon – Not sure what your policy is on posting YouTube links, but this is one of the most interesting videos I’ve seen on fashion in a long time. San Francisco mayor Willie Brown and Wilkes Bashford (the owner of SF’s luxury clothing store who just passed) back in 1985 on a cheesy midday TV show. Brown waxes on his mink bomber (that was gifted to him), and he discusses other politicos’ dress – including how Jesse Jackson outshined a Russian President, how Reagan wears suits made “for his older brother” and a long discussion about the state of dress. A gem of a time capsule, and – paradoxically – ahead of its time. Thanks for allowing it. Mayor Brown, by 1985, had over 50 Brioni suits, and – among other pieces, a “banana yellow leather coat by Claude Montana” – and his mink-lined Italian bomber (wonder who made that one). He was best friends with Wilkes – whose SF store was the height of decadent luxury at that time. Interestingly enough – Brown is now blind – but that hasn’t curbed his sartorial flair one bit. He favors cashmere blazers with colorful (purple) turtlenecks. So funny, you’re right about that Simon. It’s now called “athleisurewear” – led by Cucinelli, and defined by recent issues of The Rake. Yes, it’s a trend that’s been seen in fashion brands for the past 3 years or so. An interesting point back to people that say menswear is on an inevitable decline in formality. At the least, I think these swings up and down – the decade-long trends – are bigger than that underlying downward fall if there is one. Special shout out for @jkf_man for the beautiful photography. The light is exquisite! Tobacco linen has held a charm for me for as long as I can remember. Terrific outfit, Simon, from hat to shoes. He seems to have a preference for cotton fabrics and wool gabardine. Speaking of large knot grenadine, how do you think it compares with garza fina? Simon, I like that tobacco linen very much, but I’m also partial to a British tan gabardine Summer suit worn with a white shirt and black knit tie. It’s a fabulous Summer look that I enjoy year after year that’s appropriate in many different situations. I always understood that when you hold your hat, it should be held ‘crown out’ so that the lining isn’t showing. Philip – Good point and an essential part of hat etiquette. This is really a lovely suit! Perfect for the Summer! By the way, bravo to Jamie for these exquisite pics! This post eventually offers an opportunity to ask you a question about linings you barely mentionned in your reviews, if ever. Yet I find it important when it comes to bespoke outfits. So which kind of lining do you chose for Summer outfits such as this one (especially, on the trousers)? And which for Winter suits, including on the trousers? 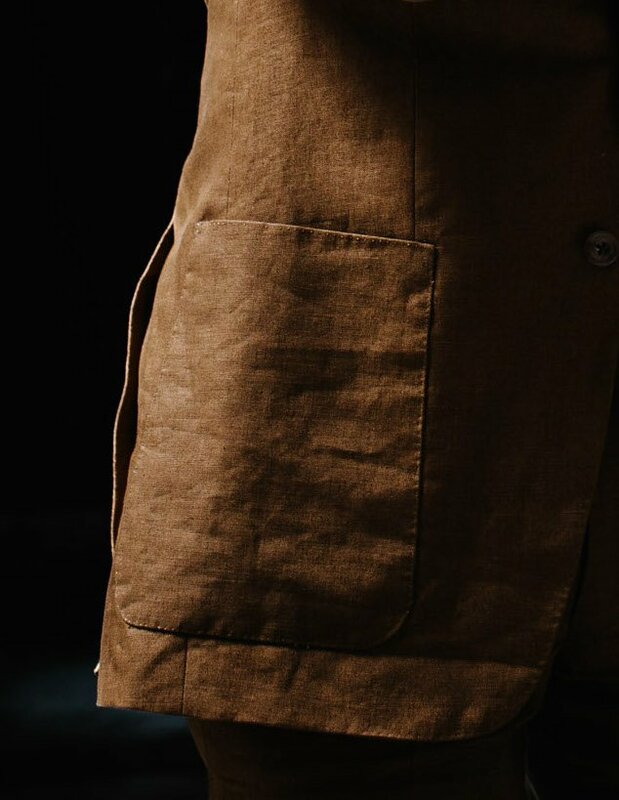 I tend to have half linings on the jackets and no lining on the trousers, for summer suits, and full linings on the jackets and half lining on the trousers, for winter suits. It does vary a little with the cloth though. When I saw this post and saw that you where wearing what seems to be one of your favourite shoes (?) I came to wonder how you are tackling one of my major shoes issues – the soles. And what kind to choose? Living in Copenhagen and travelling often to London it seems that the weather in the two cities are quite similar (meaning inconsistent and rainy). Leather soles are really nice from a look and feel perspective but often inconvenient if being caught out in the rain in may or june (or even july). How do you tackle this? Is it OK to resole a leather sole with rubber or is it better just to by shoes born that way? I still usually wear and prefer leather, but to be honest the rubbers and so good now, so clean and thin, that I would be happy to have them on all but the dressiest shoes. 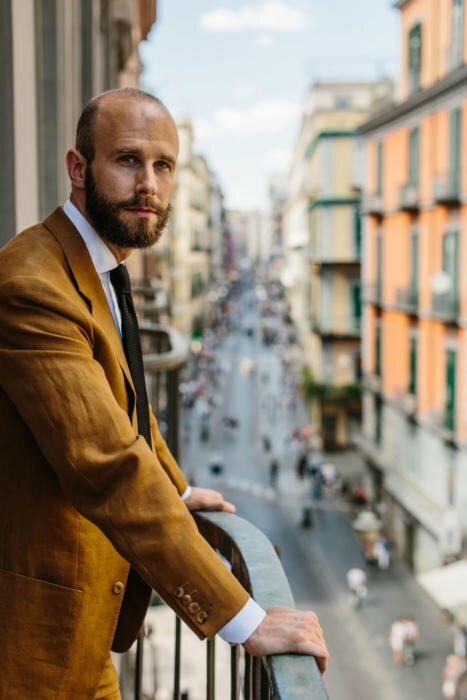 I have lived in Italy in the past, and continue to visit at least once a year, and I often see tobacco colored suits, in gabardine as well as linen, but most often paired with blue shirts rather than white. A great look–thanks for reminding me and bringing back memories of late spring and early summer days in a number of Italian cities from north to south. Simon, I forgot that I pointed out the Slim Aarons Italian aristos dress style as you noted. Something to remember is that Slim took the photos between 1950 to 1970; times change. The spretzaturra influence is mostly during the last 25 years. Interesting topic. I’m very pale, and the sun is no help – I don’t so much tan as bleach. I love cream and light coloured clothes, but I know they make me look ghostly. Other than make-up, any tips? Also, try to keep that cream away from the face, so much easier in trousers than jacket. It might still not work, but that’s your best chance. Hi Simon, great piece as always. Can I ask you about your thoughts regarding suits & material for a hospital consultant? Need to look conservative , calm but also reassuring and a little ‘softer’ than the suits worn in the City etc. Would be great to have your thoughts on the types of material, colours that one might consider. Thanks Ani. So it’s suit materials you’re wondering about mostly? Some pics, esp the last one, are very Carvagesque. The more I see the outfit, the more like it on you in that setting. I liked the point in the comments on hat etiquette – I never knew, but it makes sense. Your shoes are fantastic and bring to mind my cutters point that bad shoes ruin good tailoring. With that in mind, one of the topics I should like to see considered is how to chose a shoe for an outfit. Classic rules and a few trends. 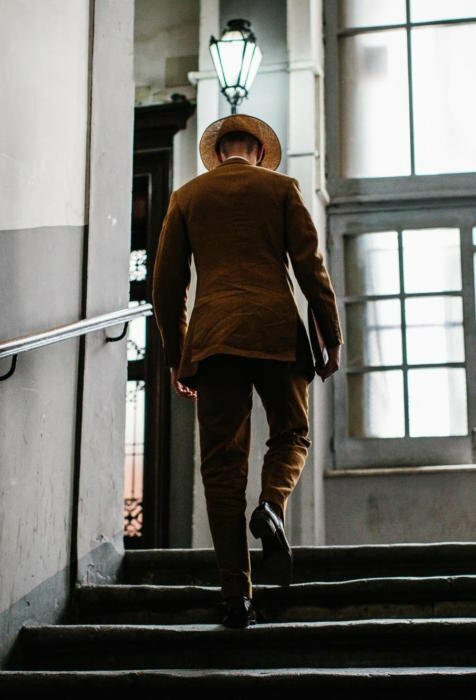 As to classic rules, when wearing a suit (SB (peak or notch lapel and DB) or odd jacket: the spectrum of formality within Oxfords (ie how a change in punching modifies formality); when and when not to wear Derby shoes (including monks); when loafers are appropriate. Also more recent trends, like loafers with a formal suit (I see a lot of that in the City of London). Also overlay all that with the shape of a shoe, colour and material (smooth calf versus suede and grain/textured skins). This will speak to people buying good quality shoes regardless of budget. It is really a development from the old posts that encourage readers to wear good quality shoes, as the next question is which to whose for what outfit… D.T. I really like this outfit – manages to look relaxed and sophisticated at the same time, which is not always an easy feat! I’d also like to add to the requests for further discussion on the subject of skin tones (and coloring in general) and their impact on clothing choices, as I haven’t found any of the standard guidelines to be of much help. For example, Alan Flusser suggests the contrast between hair color and skin tone should be reflected in the degree of contrast between suit and shirt. I have blond hair, blue eyes and fair skin, which should mean I look best with “low contrast” combinations, and yet I can’t say they look significantly better than higher contrast staples like a light blue shirt with a navy suit. (At worst, some darker combinations can look very ’90s!) Furthermore, most color-guides say people with my complexion should avoid “earth tones” like the plague, and yet olive and brown are some of my favorite colors! Are the guides mostly nonsense, or am I missing a fundamental point? Perhaps not so out of place in a wintry England. For those of us with spaniels that insist on a muddy walk in the woods before heading into the office, the colour (beautifully rich I must say) has at least a chance of hiding any mud spatters the wax cover all misses. Perhaps you’d be kind enough to run a follow-up article on how best to wear it with wellingtons? Simon, where do you suggest I go for moleskin trousers and in particular a modern tapered cut in a tobacco colour? beautiful outfit. Perfectly fitting the “Italian way”. Would you pair black shoes as well with such combination? If yes, what color for the socks would work the best? Yes, you could wear black shoes with this. Perhaps in something a little less formal, like a loafer. Do you have a reference/ source for the Aarons photograph?